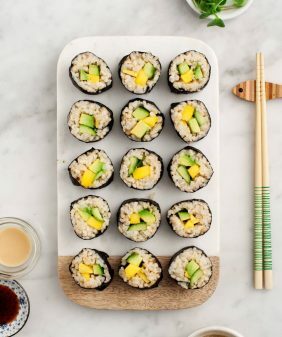 Mango recipes! 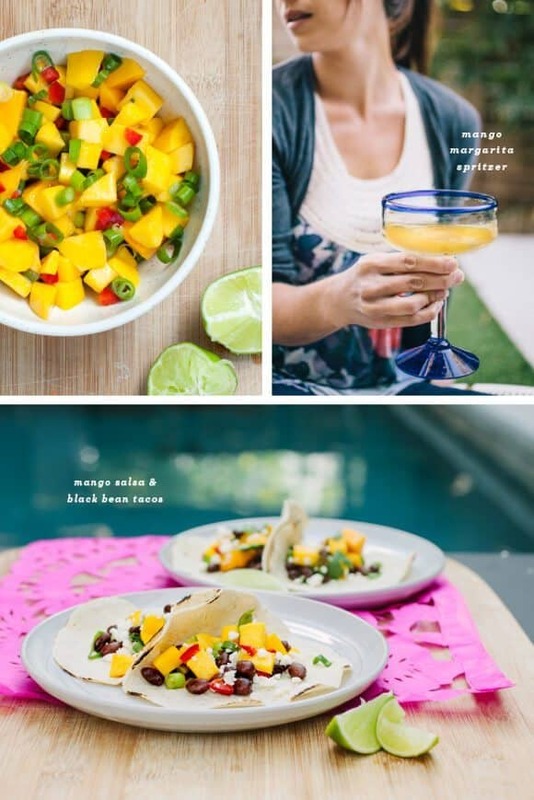 mango salsa, mango margarita spritzer, mango black bean tacos, and a mango avocado salad. We celebrated Cinco de Mayo a little early this year with a mango fiesta. You should too because mangoes are on sale (like, $1 something) at Whole Foods until the end of April. I brought home muchos mangoes last weekend and mixed up this sweet & spicy salsa. Then (from the same salsa recipe), I made black bean tacos and an avocado-mango salad. And, of course, no fiesta is complete without tequila. I made a lighter version of a margarita – a mango margarita spritzer. Cheers! Mix all ingredients together. Taste and adjust. Serve chilled (best if you let it chill for at least 30 or so minutes). Stir black beans and dried cumin or chipotle into your mango salsa. Taste and add a little salt if necessary. Let the black beans marinate in the salsa for awhile (optional, but recommended). Spoon into tortillas and serve with crumbly cheese. Toss everything together, taste & adjust. Mix everything (except the sparking water) together in a blender. Taste and adjust, pouring the sparkling water at the end. I think we all have mangoes on our mind. Here in Canada because our weather was miserable until this week and you guys because of the impending holiday. I made a Pineapple Mango Salad last week and posted it on the blog. Super simple, sweet and spicy. Next time I’ll add it to tacos, because that just looks amazing. 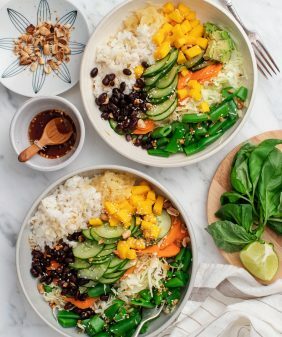 Love the colors in this meal, reminds me of spring. Looks delicious. Beautiful photos as always! How fun are these pics?! 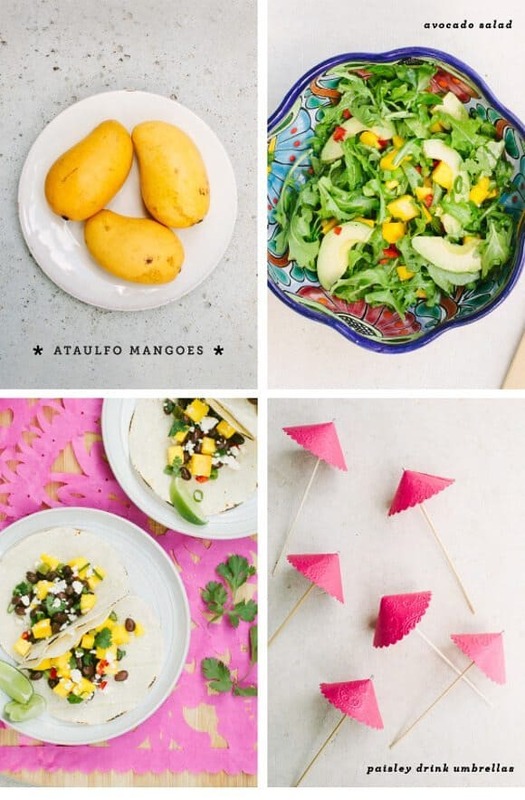 And such a great idea to plan a fiesta around a fruit! 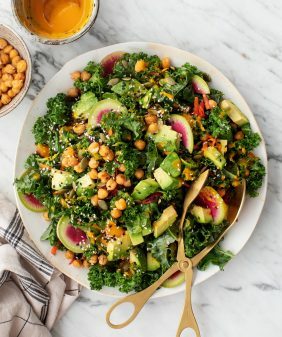 Love it and everything looks so delicious and healthy. I love me some mangos! I love ataulfo mangoes! To me, they’re known as manila mangoes. I made a wonderful manila mango and lemongrass ice cream a few weeks ago and it was awesome. I love anything mango – yum! So pretty! This is a lot like the pineapple salsa I posted today! Loving this fiesta! Oh, I just love the backgrounds in these shots! Your pool looks so inviting. I wish I lived closer to a Whole Foods so I could get into this mango action! Everything looks delicious! Looking forward to Cinco de Mayo even more after this. Love these photos, the colours pop so much! 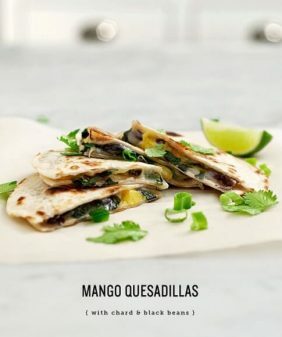 Gorgeous recipes, love mango in EVERYTHING and anything! Love the idea of lightening up a mango margarita with sparkling water! Will try that soon as a variation on my own mango margarita recipe. 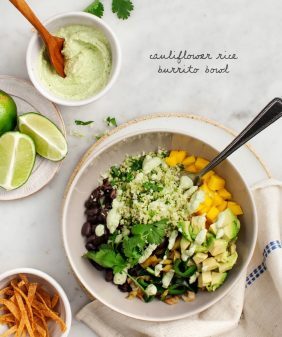 Thanks for the beautiful recipes, and happy early Cinco de Mayo to you! 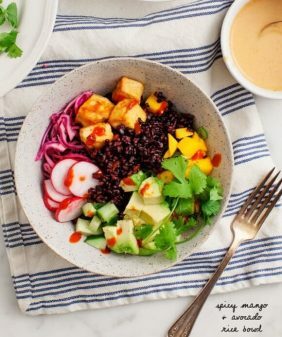 Mango in salad is a great idea, thanks for sharing! I recently made mango salsa too but this time with couscous to accompany fish. Since it can be hard to find cilantro in Europe, I tend to use a touch of fresh parsley or mint instead. i looove mangoes, I always do these mango salsas actually. I cannot wait to try and make the margaritas, it seems like it would taste really fresh! This is my kind of party! Looks so delicious + fresh! That mango margarita spritzer looks wonderful. Yum! Mmm a margarita spritzer sounds wonderful! And Giulia it’s cold in my part of Canada (Southern AB) right now, and windy! What about where you are?